By popular demand, Patrick and Alex talk about The Truman Show and get their own 24-hour-a-day TV show. Also, good show as usual! Haven't seen this one in years; I might have to revisit it. Thanks for doing this! And welcome back, Alex! I love this movie very much and think it's really interesting and every bit as prescient as Network in some ways, covering a lot of interesting themes that only become more relevant as time marches on. I also personally feel like it's one of Jim Carrey's best performances (certainly of his roles that are more on the serious side). I haven't watched it super recently now, but my memory is that he's pretty much perfect for the role. Ed Harris is also really awesome as Christof, I feel. I'm glad you briefly mentioned the haunting piano melody, because that's something else I love. The score is beautiful and great. 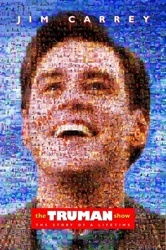 I hope that people will revisit and rediscover The Truman Show over the years, and that it develops a lasting positive reputation along the lines of Network. I think this movie deserves it, and, as great as Witness or Master and Commander are (and I do like Dead Poets Society, too), it stands as my personal favorite Peter Weir movie for all of the fascinating things it has to say and the themes it explores. Also, fun fact: I don't know about any previous casting choices for the character of Truman, if there even were any, but Dennis Hopper was originally cast to play Christoph, but quit for some reason and Ed Harris took over. Actually, I read just now on IMDB's trivia section that I guess at one point Andrew Niccol was going to direct and Gary Oldman was going to star. AND apparently at another point Sam Raimi was considered to direct and David Cronenberg turned the project down. Interesting. I like what we got, though. Those are interesting casting choices. Dennis Hopper would have made the character quite different, I am glad they went with Harris. I don't think Hopper could have pulled off the convoluted pathos of tenderness/god-complex that Harris did. Great podcast! I like The Truman Show fine enough, but think the story would probably be best served if it was trimmed down to an hour and shown as an episode of The Twilight Zone. Ultimately I just don't care enough about Truman to follow him for a whole movie (and maybe the shift in perspective you talk about has something to do with that). My favorite moment is actually the very last line - it's a perfect little pinprick to Christof's megalomania. Here he's built this massive world where he is God, and ultimately it's nothing more than another TV show. Two early Peter Weir films that are worthy of attention are Picnic at Hanging Rock and The Last Wave. PAHR is a real challenge for American audiences, for reasons that would spoil the film if mentioned. Regarding the "Truman Show" concept as an episode of "The Twilight Zone", see the 2nd series, 3rd season episode, "Special Service" (original air date April 8, 1989). David Naughton ("An American Werewolf in London") is the lead. I just read the episode description on epguides.com. Holy cow! I wonder if there were any lawsuits behind the scenes when The Truman Show came out. Well, now I cannot STOP thinking about Dennis Hopper as Christof. So thank you for that. Damn straight Bug's Life is the better one. I'm not convinced this theory holds true. But it's worth noting that EdTV is an (inferior, IMHO) remake of Louis 19: King of the Airwaves, a movie from Canada (Quebec). Louis 19 doesn't aspire to be Truman but it's a decent comedy. I have not. I am Weir-deficient. But I will. Should check out Gallipoli. Considered one of the Australian classics.